First, only the eponymous first story in this book is related to the Old Filth trilogy. Many of the other stories have been published elsewhere and prior to this volume. The story entitled “The Milly Ming” is about a situation found in Gardham’s novel,“The Queen of the Tambourine.” The other stories in this volume are about different characters with varied settings scattered throughout Britain (I think). Moving on – the characters range from the only a bit strange, through weird and grotesque to a bit deranged – maybe occult? A connecting theme might be love – maybe – and/or age. 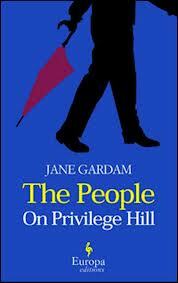 Jane Gardham is a very British writer, the books are intended for English readers which I am not. The stories wander around with odd plot twists and surprises – then they keep going! That said, I enjoy them, particularly that first one, “The People of Privilege Hill” related to the Old Filth trilogy – the way that Edward Feathers and Terry Veneering played out – and Fiscal-Smith and Dulcie. “Pangbourne” is very sweet about a woman’s love for an orangutang . “Snap” is funny – how NOT to have an affair. ‘The Latter Days of Mr Jones” was so sad but in the end not overwhelming, Gardham manages to redeem almost anything. Meanwhile “Flight Path” is a bit eerie – really – and “Waiting for a Stranger” is more than that. I have several books still to go by Gardham – mostly her earlier ones but I loved God on the Rocks – we’ll see. Thanks for visiting as well as the comment. Yes, I truly enjoyed the Old Filth Trilogy – the characters stuck, somehow, and grew on me. Enjoy your holiday!